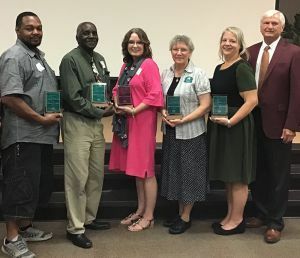 Pensacola State recognized six of its own during the College’s 2018 Employees of the Year ceremony held Thursday, July 19. Colleagues, family and friends filled the Delaino Student Center on the Pensacola campus as PSC President Ed Meadows presented awards and lauded each honoree. Diane M. Bracken, director of Facilities, Planning and Construction, was named the Supervisor of the Year. Debbie Stallworth, Dental Clinic Technician, Allied Health, Warrington campus. Bracken has been at Pensacola State for seven and half years. She was the director of Facilities, Planning and Construction at Northwest Florida State College for 14 years before moving to Pensacola to work for an engineering firm. While at the firm, she did consulting work for Pensacola State before being hired by the College in 2010. Bracken is married to Larry Bracken, who was the College’s director of government affairs before retiring several years ago. Bigelow-Jordan has been at the College for 20 years. She began her career as an office assistant on the Pensacola campus. A first-generation college graduate, Bigelow-Jordan earned her bachelor’s degree in business and management from Pensacola State. Her son, Devyn, is also a Pensacola State graduate and her son, Austin, is a dual-enrolled student at the College. Davis has worked at Pensacola State since he was 14 years old – starting off as a summer youth program worker. He has been employed full-time by the College for 16 years and is a Pensacola State and Booker T. Washington High School graduate. His mother, Mary Davis, also worked at the College for many years before retiring. Donnell has been at Pensacola State 11 years. She earned her associate in art degree in 1973 from Pensacola Junior College. When she started at PJC, she rode the College bus (which passed her Santa Rosa County home) to and from classes. Seay has been at Pensacola State for 18 years. A Brooklyn, New York, native, Seay said he interviewed for a job in the mailroom because the College sounded like a great place to work. His daughter, Destiny, is now a Pensacola State student. Stallworth has been with Pensacola State for 34 years. A graduate of the Florida Dental College and Pensacola High School, she worked in a dentist office for 10 years before joining the Pensacola State family.